It was a historic day for KTM on Saturday, and one a long time coming. Here's a recap of the brand's other memorable moments en route to finally capturing a premiere-class AMA National Championship. The Austrian brand was put on the map by Russian 250 GP riders Gennady Moisseev and Vladimir Kavinov, who were allowed by their Soviet government to switch from CZs to KTMs halfway through the '72 season. Moisseev would go on to win the 1974 250cc World Championship for KTM in dramatic fashion over Jaroslav Falta, and then added two more world titles in 1977 and '78. After going title-less since the Moisseev years in the late ‘70s, KTM rebuilt in the mid ‘80s and had a couple of rising stars in the Dutchman Kees Van der Ven and homegrown Austrian Heinz Kinigadner. Van der Ven captured KTM's first major win in the United States by taking the 1982 Unadilla 250 USGP. “The Baker” as Kinigadner was known (I suppose, and this is just a wild guess, he liked baking?) reached GP glory for the Austrian marquee when he won back-to-back titles in the 250 World Championship in 1984 and 1985. Both riders would move up to the 500’s shortly after and while never winning another world title, Kees captured 17 Grand Prix wins and Kini captured seven. Both riders went on to great heights with KTM after hanging up the boots, Van der Ven winning world titles with his own team and Heinz being involved with KTM in the management side. Trampas Parker came out of nowhere to win the 1989 125 world title. After Kinigadner’s two titles, KTM again went through a bit of a drought but reloaded in 1989 with a trio of Americans in an attempt to get the 125 world title. Mike Healey, Bobby Moore and an unknown rider named Trampas Parker all campaigned the all-new KTM 125 that season and many times, the three riders were 1-2-3. The bike was a screamer and by all accounts had tremendous power, which helped Parker capture the crown after not being on anyone’s radar before the season. Healey ended up third overall that year, too, which started a new path for KTM on small bikes. The 1991 Camel Supercross series will be remembered for the mighty Jean-Michel Bayle’s season, where he became the first foreign rider to win America’s premier series in the modern era, but behind him a European manufacturer had some highlights, too. San Diego's Mike Fisher, for years a factory Kawasaki R&D rider, had jumped to the lime green KTM for ’91 and did very well. On a bike that wasn’t on the level of his competitors factory machines, Fisher finished fourth in three 250 main events, and took eighth overall on the year. Fisher rode so well indoors that KTM changed the handle of their U.S. motocross bikes to the SX moniker, which sticks around to this day. The year 2000 marked a big-time return to American motocross by KTM as the team regrouped after being out for a number of years (the company even went through bankruptcy at one point). They invested in a semi and hired some up and coming riders to compete in the 125 Class indoors and out, and also imported ex-World Champion Shanye King to ride the all-new 520 four-stroke. The results that season were so-so but the highlight was no doubt the team’s win at High Point with Kelly Smith, which marked the very first win in AMA supercross/motocross for the Austrians. On a cold and muddy day, Smith took his hydraulic clutched, no-link KTM SX125 to the first moto win and backed it up with a fourth in the second moto for the overall. It was the highlight of the year for KTM and somewhat justified the team’s program and bikes in the eyes of many. Grant Langston lost the 2001 125 National Championship in heart-breaking fashion. 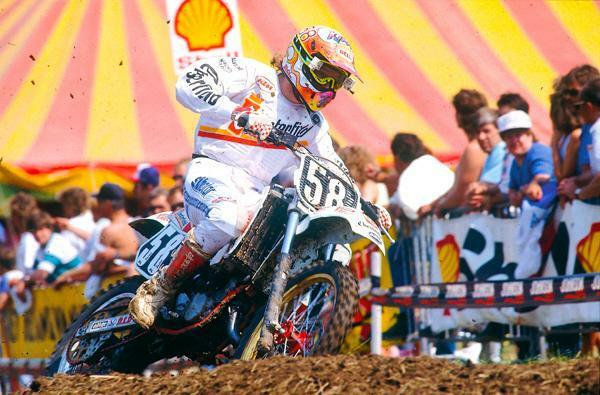 After Kelly Smith and company dipped a toe in muddy waters in 2000, the brand came in ready to win (and ready to race, of course) in 2001 by importing 2000 World 125 MX Champion Grant Langston and proven American pilots Brock Sellards and our own David Pingree. The effort was still pretty new and there were bumps in the road, but Langston ended up with a fighting chance at the 125 National Championship after a vicious summer duel with Mike Brown and Travis Pastrana. In fact, heading into the last moto of the season, Langston appeared to have the title on lock until his rear wheel blew up at Steel City, and he DNFed, handing the title to Kawasaki's Brown in heart-breaking fashion. It stung at the time, but the season also proved KTM was a legitimate contender in this country. 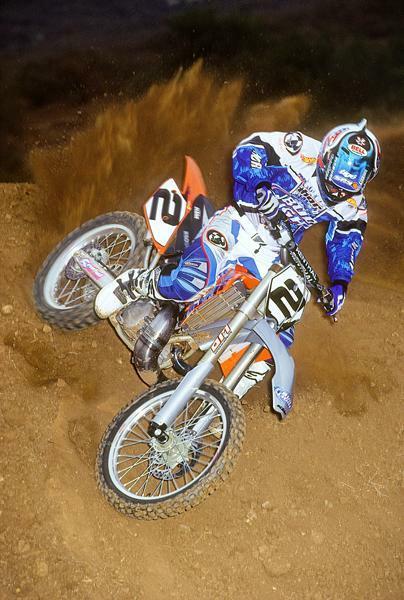 For 2002, KTM made a big-buck push and signed Jeremy McGrath to race the all-new 250SX in supercross. It went terribly, but there was one upside to the program. Once MC pulled the plug on his own effort, his team manager Larry Brooks was absorbed into the KTM factory team. He took the program to the next level, and by 2003, when defending 125 National Champion James Stewart went out with an injury, Brooks and KTM were in position to win the title that got away in '01. Langston and teammate Ryan Hughes fought (literally, at times) with Brown for the points lead. 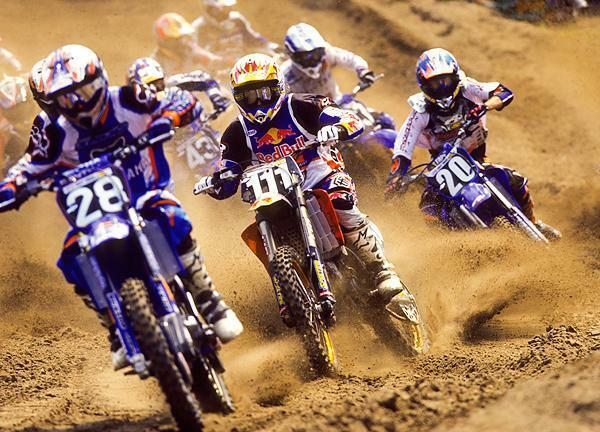 KTM teammates were pulling over to help Langston and Hughes score maximum points (poor Josh Woods gave up what would have been the only National MX podium of his career at Broome-Tioga in 2003 to move over for Langston). Then, the final round of the season in Troy, Ohio was rained out. Langston, leading the points at the time, was awarded the title via a phone call from the AMA. KTM finally had their AMA number-one plate, although Hughes is surely still pissed about this one! Jeremy McGrath had a short stint with KTM in 2002. Riders like Mike Alessi, Nathan Ramsey and Josh Hansen (yes) kept KTM toward the front of the pack in U.S. Lites Class racing for a few years, but the brand's run of success here started to dry up. But its efforts in Europe moved forward. Since Langston's 2000 125 world title, KTM has taken eight of the last 12 titles in that class (now MX2). This includes the last four titles, and with Jeffrey Herlings currently leading the MX2 Class it could be five. While KTM was dominant in the MX2 Class, the MX1 class proved a tougher nut to crack—partially because Stefan Everts owned the division on his Yamaha. Well, if you can't beat 'em, join 'em. And when Everts retired from racing KTM snapped him up as part of a management team chock full of former GP race winners (Everts' boss Pit Beirer was a mainstay 250 GP title contender until an injury ended his career). KTM eventually linked up to the De Carli team, which had been winning titles on Yamahas with Antonio Cairolli. Many wondered how Tony would do on the controversial 350SX-F in 2010, but he successfully defended his world title, and then won it again last year (and leads the points this year). Next stop, America! Ryan Dungey made history for KTM last Saturday. August 18, 2012 is going to stand out as one of the biggest days in KTM history, as the brand not only completed a stunning turn around by winning the 450 Class AMA National MX title with Ryan Dungey, but added a 250 moto win by Ken Roczen and 250 overall win by Marvin Musquin. Just a few years ago, KTM's factory racing team in the U.S. had been relegated to satellite factory status with the MDK squad. And even in their heydays of the early 2000s, the brand was never able to contend on big bikes. Thanks to the efforts of Roger DeCoster, Everts, Bierer and of course Dungey and company, the team now stands on equal footing with the Japanese brands here, and ahead of them back home.